NHL News : Laine and Maroon trade some of the most hilarious chirps of the season! Laine and Maroon trade some of the most hilarious chirps of the season! A true war of words. Alright this has got to be one of my favorite moments of the 2019 Stanley Cup Playoffs thus far. During the playoffs a lot of the focus can be on the bad blood that inevitably develops between the two teams that have to play a minimum of 4 consecutive games against one another, but sometimes those rivalries can develop in ways that don't necessarily have to be hateful, or violent. 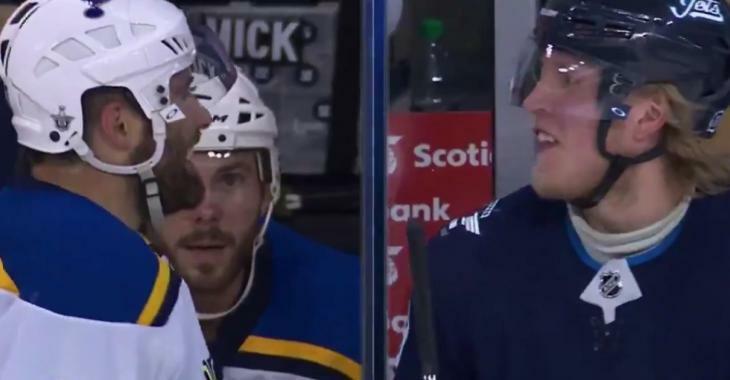 This is exactly what appears to be the case between Winnipeg Jets forward Patrik Laine and St. Louis Blues veteran Patrick Maroon in their first round series in the Stanley Cup Playoffs. The two Patricks got some attention this week after they were caught jaw jacking one another on camera but when you hear what they were actually saying to one another you won't exactly feel the intimidation factor all that much. No instead of threatening one another the two men were instead taking some rather amusing jabs at one another, although I must admit that I am not entirely sure that they were meant to be comedic at the time they were uttered. Thankfully the National Hockey League's broadcast crew was able to provide us a transcript of exactly what was said between the two men and I must admit the exchange was awesome. That being said, if I get a vote on this one I have to give the early victory to Patrick Maroon here who had some fire comebacks for Laine. According to the broadcast it was Laine who started off the banter with a pretty rough shot at Maroon's weight. "I might be chubby but I'm effective," said the Blues forward with a smile on his face. It was with the next line however that Laine really set himself up for failure. "Go back to the minors," said Laine. Maroon's response to this one completely destroyed Laine in my opinion.
" I can't. I have the same amount of points as you," fired back Maroon. Now these comments could certainly be interpreted as being mean spirited, and perhaps they were, but both men appeared to be smiling at the end of the exchange, and I'm sure you will be as well.